“Guodros Medis”, the branch of “Guodra Ltd.”, was founded in 1998. A team of qualified professionals was looking for opportunities to produce high-quality products through the introduction of the equipment of latest technology. Fifteen years of work experience in the field of woodworking allowed us to develop about 5000 of original wooden construction projects and be able to qualitatively implement individual designs of customers. 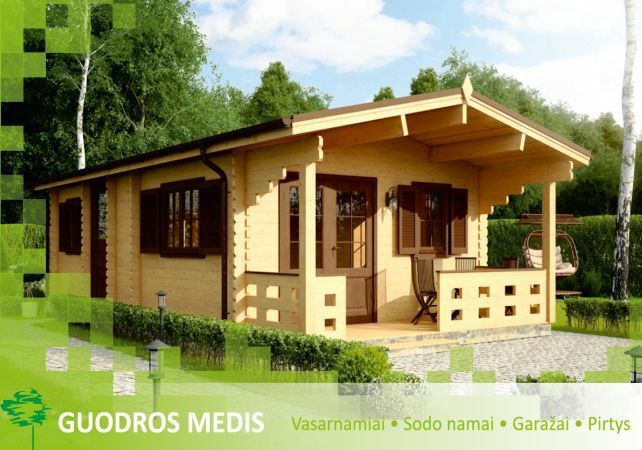 The main product of the company is wooden summer houses, garden houses and saunas made from milled wooden prefabricated lumber. The products are manufactured according to standard and individual projects prepared at customer’s request. The main raw material includes pine, spruce, aspen and linden timber, which is dried in computerized convection drying chambers of our company. The moisture content of timber used is 12-16%. The thickness of lumbers used for summer houses is 28mm, 35mm, 44mm, 60mm and 92mm. The thickness of floorboards is 22mm, 28mm or 32mm. The thickness of roof boards is 19mm. Our company manufactures windows and doors complemented with glasses or glass packets. “Roto” and “GU” hinge systems are used which allow the windows to be opened in both directions. About 95% of production manufactured by “Guodros Medis” is exported to European, Asian and African countries. The increasing demand for high quality wood products in Lithuania encourages us to expand the production and sales on the local market. Since 2010, after the installation of new production line, we started the manufacture of furniture parts which are supplied to the largest furniture manufacturers. Since 2012 we are the official representative of the Dutch company “Jungle Gym” in Lithuania. We can offer the constructions for children playgrounds of the highest quality the wooden components of which are manufactured by our company. The main goal of our company is to implement the customers’ expectations professionally and efficiently.